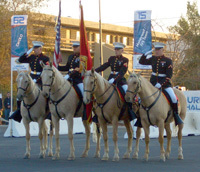 A color guard of U.S. Marines on wild mustangs opens the the 2007 DARPA Urban Challenge. Stanford's Junior passes human-piloted cars it has deemed too slow-moving. Stanford's Junior stops at an intersection before making a right turn. Thirty-five teams of robotic, mechanical, automotive, and artificial intelligence engineers gathered in Victorville, California in late October to participate in the National Qualifying Event of the DARPA Urban Challenge. Unlike the prior events where autonomous vehicles were challenged to find their way around an off-highway course, this year's event required that these specialized robots be able to drive in an urban setting, navigate traffic circles and stop signs, and make decisions based on scenarios presented to them. Some of these scenarios included making safe decisions when driving down roads filled with human-driven automobiles and, in the final event, with other bots. The map at the left shows the complex route that DARPA constructed inside a former housing development at the now-closed George Air Force Base. The 'bots used several forms of scanners and sensors to capture data. Then, a series of complex algorithms enabled the robots' brains to make smart driving decisions. Several 'bots were sporting a roof-mounted device that looked a little like a spinning attic fan. It turns out this was a $75,000 LIDAR device that emits 64 laser beams at various angles. The device reads the intensity of the reflections that bounce back when the laser beams hit something. These devices can distinguish curbs, lane markers, cars, and even people at rather extraordinary ranges. The problem with these units -- beyond the price tag -- is that they can deliver too much information and confuse the robots unless their "brains" have sufficient filtering and analyzing capabilities. Some 'bots used laser scanning devices and stereoscopic video to map the roads in front of them. Team Caltech had what may have been the most "sci-fi" looking device. Known as the "all-seeing eye," it looked like a periscope. When making decisions on which way to go, it could bend over or look sideways. The sensors mounted on the front of the University of Central Florida's Subaru Outback called Knight Rider would actually swivel left and right when stopped at street intersections. It looked like the car was checking to see if the road was clear in near-humanoid fashion. Most of the scanning devices have difficulty reading darker-colored objects, as the test track driver of a dark blue Taurus discovered when Axion Racing's Spirit tagged his rear fender during one test early in the week. The Golem Group, a team that competed in both the 2004 and 2005 events, fielded a Toyota Prius that experienced an accelerator problem during one of the qualifying events. This video (click on the second screen) gives ample reason to stay alert when working around 'bots! After several days of tests and trials, DARPA winnowed the final field to eleven teams. DARPA deserves a tremendous deal of credit for structuring the Urban Challenge in such a way that the public was welcomed and accommodated at the event. Sightlines for professional and amateur photographers were generally excellent, as evidenced by the plentiful supply of video clips available online. While the sidelines offered good views, I would have loved to have had access to the DARPA control room. From the control room, program administrators could see and manage (or at least pause and re-start) every one of the 60+ vehicles that were on the 60-mile course during the race. This event was really a series of skill tests and not purely a speed race. From a spectator's point of view, it would have been more interesting if the event had been scored like a rodeo, with points being awarded for each section of the course, producing a champion by the end of the event. As it was, the scoring was largely a well-kept DARPA secret. Of the eleven teams that started, two had close encounters with structures when they wandered from the approved race course. When the massive vehicle sponsored by the Oshkosh truck company looked like it was about to bust a new door in the side of the former base exchange, it was removed from the race. In another example of mysterious 'bot independent thinking, UCF's Knight Rider calmly drove into a residential driveway and parked in front of the house. Unfortunately, that behavior -- although very cautious and reasonable -- was not on the mission statement, and the robot was disqualified. Early in the race, Honeywell's Ford pickup called XAV-250 made an unusual U-Turn in the starting area and crunched a K-rail before being re-set. Later in the race, XAV-250 encountered Cornell University's SkyNet in the wrong lane. Rather than risk a head-on collision, it pulled to the right and jumped a curb to avoid the wayward 'bot. At one point in the race, I watched as MIT's Land Rover called Talos and XAV-250 accelerate down a long straight run. Both briefly crossed over the center line and missed a head-on by a matter of inches. I regret that I didn't get a photo, but I was otherwise occupied seeking safety behind the nearest tree! I wasn't sure the concrete K-rail in front of me was entirely up to the task of keeping that much moving steel at bay. In the same area of the course, I saw another defining moment in this year's Urban Challenge. Stanford University's Volkswagen Passat called Junior passed two cars when it decided that Cornell's SkyNet was taking too much time to turn right at the next corner. Although not reported by other media, Boss, Carnegie-Mellon's Chevy Tahoe, had a close encounter with the K-rail in this same area when it braked and turned to avoid a human-driven vehicle that had passed on the left. It was a surprise, because no other car had "spooked" the high-performing Boss up to that point. After a while, it seemed almost normal to be watching driverless vehicles whiz by. Even so, I was never entirely confident that Talos, MIT's Land Rover, wouldn't suddenly decide to make a run at the crowd. Another impressive achievement on display at the Urban Challenge was the ease with which some of the 'bots could execute left and right turns at stop signs. Some of the vehicles used "stepper" motors for steering, which are very strong but cause the wheel to turn with jerky motions. Others used more expensive synchronous gearing, and their steering wheels moved as smoothly as if they were being turned by a human driver. Nearly all of the 'bots "remembered" to use turn indicators correctly, and most managed to stop in front of the white lines at intersections. Despite the advanced LIDARs, I was not tempted to volunteer to be a test pedestrian -- scary behavior was still far too much in evidence. In the end, six of these remarkable robots completed the Urban Challenge course. For a while, it looked like Odin, Virginia Tech's hybrid Ford Escape, would be the winner, since it seemed to have a large time lead over the other contenders. The next morning at the awards ceremony, however, Carnegie Mellon's Boss and Stanford's Junior took the top spots. Odin came in third. None of these bots are sophisticated enough to start taking the kids to soccer practice, but the degree of technological improvement that I have witnessed since the early trials of the 2004 Grand Challenge is nothing short of miraculous. There were some odd disqualifications and situations where certain 'bots appeared to be given a little extra help in finishing the course, but overall this was a memorably unique day. No one can predict at this point whether there will be another DARPA Challenge, but I for one hope so. There is nothing quite like watching the stuff of fiction hit the tarmac and drive right on by.